Porsche has been one of the biggest names in the privateer racing business, and today the automaker released information on the new Porsche 911 GT3 R factory race car intended for race teams and privateers to participate in the GT3 class. 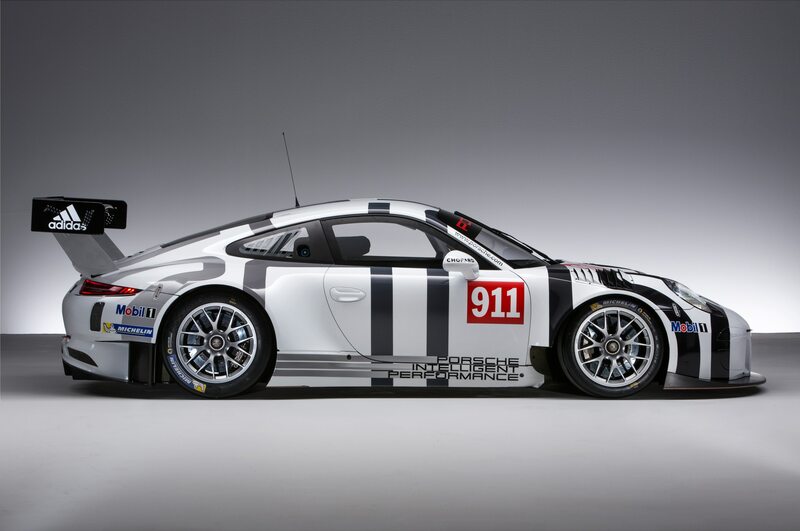 The newest 911 race car is based on the recently debuted 2016 Porsche 911 GT3 RS. 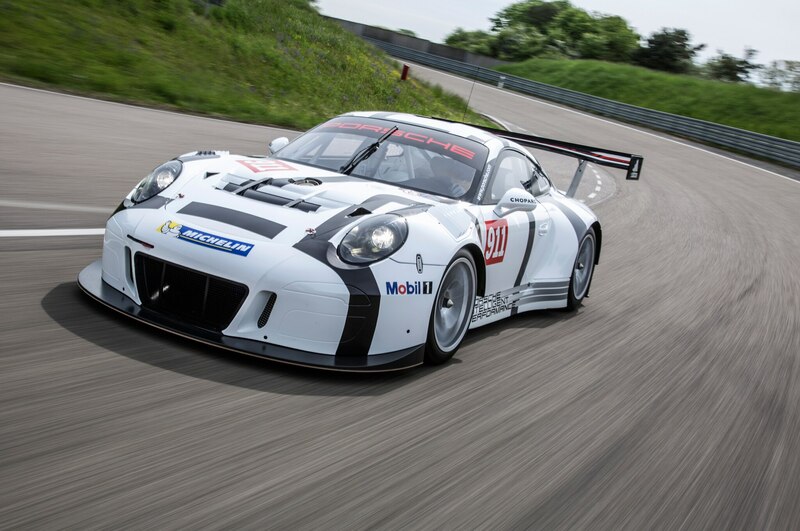 Both cars share the same 4.0-liter flat-six engine, but while the street car boasts 493 hp, Porsche says the GT3 R has “500-hp plus”. All this power is sent to the rear wheels via a six-speed sequential transmission operated through wheel-mounted paddles. The new GT3 R is 3.3 inches longer than the previous generation of the racing car, and its track is also wider. The Porsche engineers worked hard to centralize as much components as possible to bring down the center of gravity, including moving the radiator from the side of the engine bay to a more central position. Radical changes were made to the aerodynamic wings and trim. 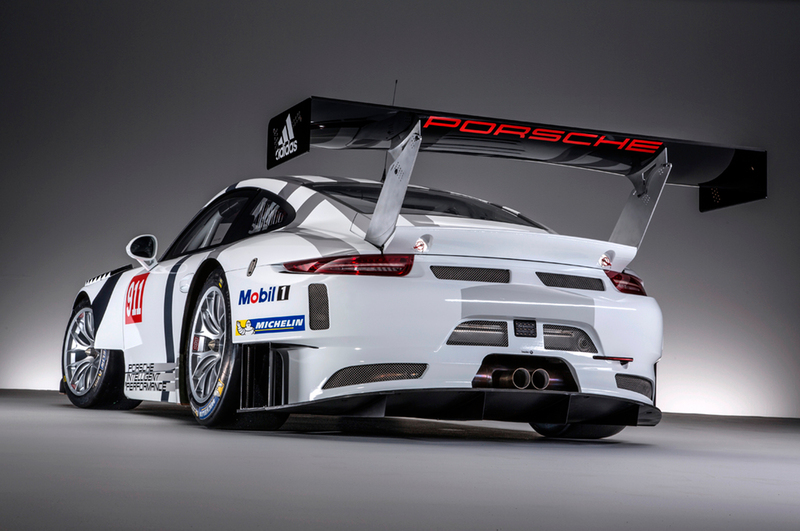 Aside from traditional winglets and splitters, the new GT3 R features supremely cool front wheel arch air vents, which increase downforce to the front axle, and an over six feet-wide rear wing large enough to conduct a round-table business meeting upon. Fifteen-inch, six-piston front brakes and 14.6-inch, four-piston rear brakes help burn off speed. The fuel cell has been revised as well, with an additional 3.2 gallons of capacity, boosting total fuel capacity to hold 31.7 gallons so drivers can spend longer stints on the track between pit stops. Remember when we said it helps to be fabulously wealthy? 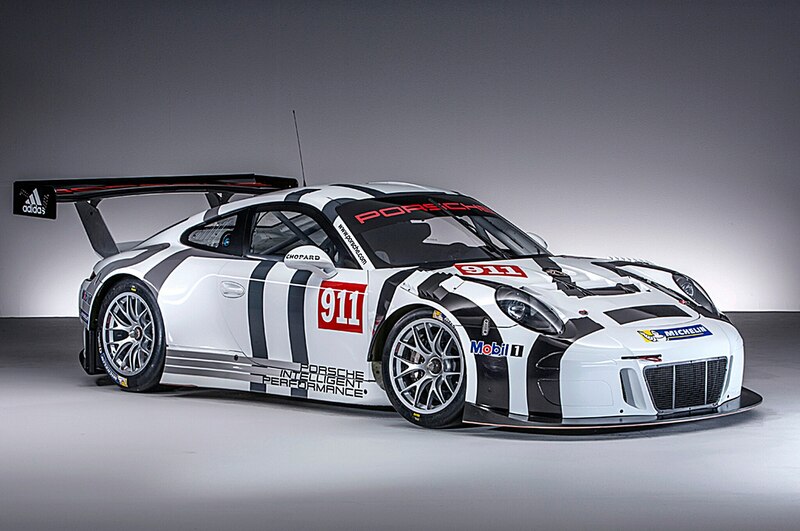 Well, the GT3 R stickers at $486,807. This hefty price tag buys the customer a competitive entry into popular GT3-class racing series, competing against a field of Ferraris, Audis, Corvettes, and BMWs. The new GT3 R will be eligible for international GT3-spec racing series when it makes its competition debut in 2016. That means you should expect to see the car in various global series, including Europe’s popular Blancpain GT Series. In the United States, the 911 GT3 R will be eligible to run in the GT Daytona class in the IMSA-sanctioned Tudor United Sports Car Championship, where it will debut at the 2016 Rolex 24 at Daytona, replacing the 997-series 911-based GT America that teams now use. The GT America will next season no longer be eligible for GTD competition. The 991 Carrera 4-based, factory-backed 911 RSR race cars that now compete in Tudor’s GT Le Mans class — and, of course, at the 24 Hours of Le Mans — will continue in that category. (The 991-based 911 GT3 road car was not ready when Porsche had to homologate its 991 RSR, hence the use of the Carrera 4.) Also expect to see the new GT3 R in the Pirelli World Challenge’s GT category, a division already strongly populated by GT3-spec machinery. 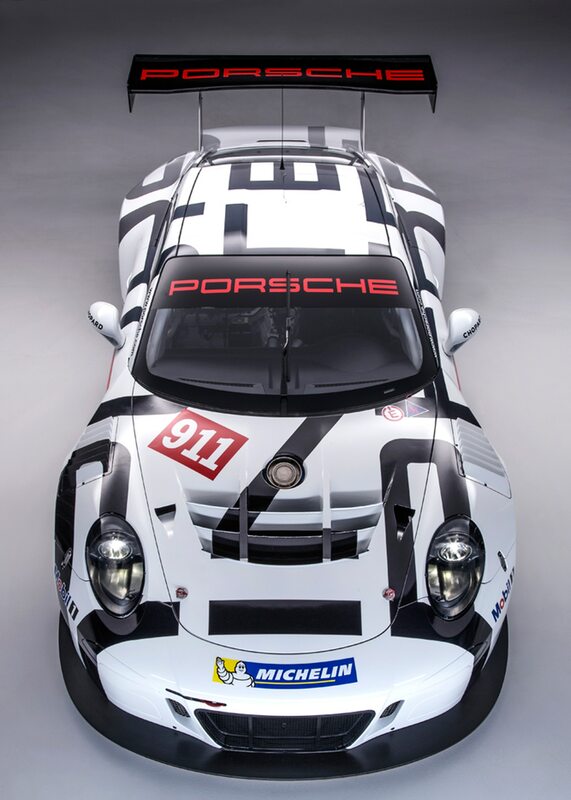 Teams presently running 911s in World Challenge GT are using the old 997-based 911 GT3 R.
Porsche will begin deliveries of the new 911 GT3 R to customers in December. If supporting a full-blown GT race car is too rich for your blood, Porsche now offers a new Porsche Track Precision app to make you feel more like a pro racing driver. 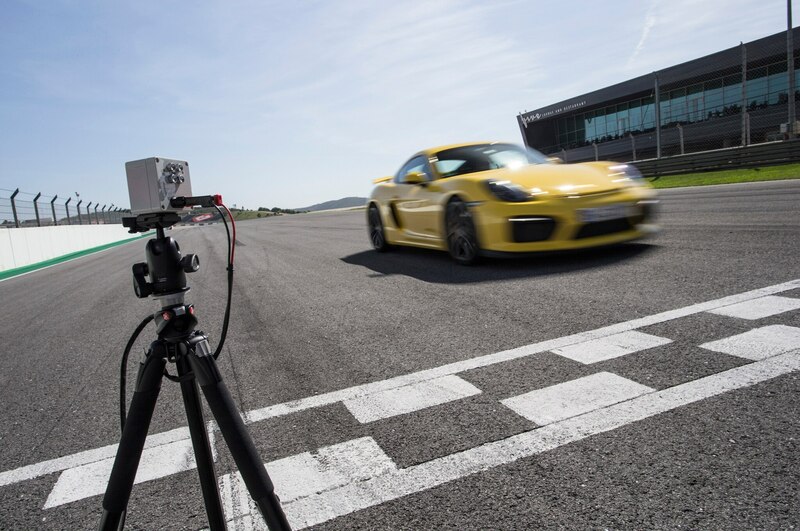 As part of a special Sport Chrono Package available exclusively on Porsche 911 GT3 and Cayman GT4 models, the app offers in-depth on-track information, including lap times, g-meter, and live telemetry, similar to the functions of the Performance Data Recorder available on the 2015 Chevrolet Corvette. The app will keep track of throttle, brake, steering wheel, and gear lever position for those drivers who want to eke out as much efficiency and lap time improvement as possible, along with a video record of the finished laps. The package starts at $1,711, and drivers can pay $1,288 for a light-beam-triggered lap switch that provides more accurate lap times than GPS information alone.